Hey Jorge! 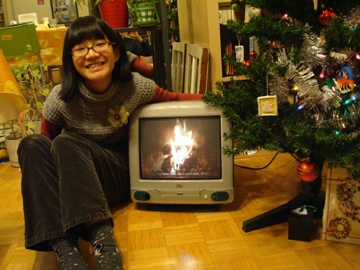 Where’s the tree and what’s with the fire? 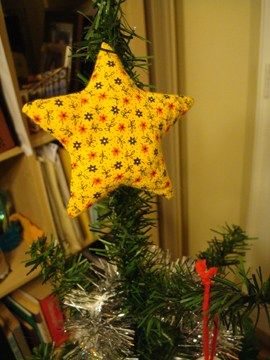 A yellow fabric star that Mike made when he was 5 makes the tree topper every year. Meet Snow Bear! 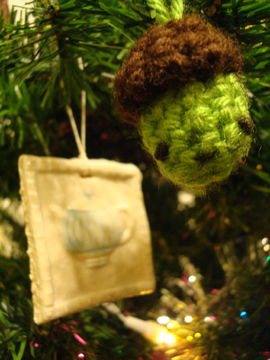 I made him at school 2 Christmases ago. We were supposed to make a sculpture for a role play exercise, and he’s made of a Styrofoam cone and some corn and seeds, but I can’t bear to toss him away. And next we have my favourite chipmunk in the tree. 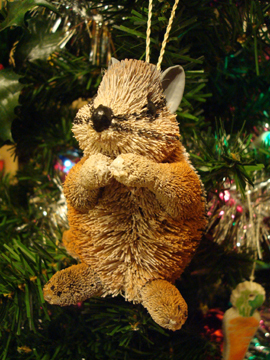 (Jorge: but isn’t there only one chipmunk in the tree…?) I saw him at Pottery Barn and just had to bring him home. I’m not one who shops at Pottery Barn ever, but I had a gift card! :D So it was meant to be. Actually, I originally bought him for a secret Santa gift but I mean, who could ever give away a chipmunk with ears made of pistachio shells? 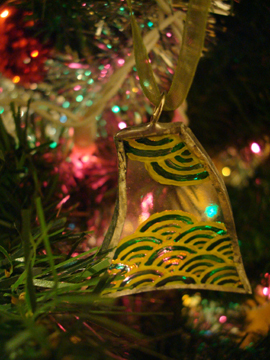 One year I made many of these ornaments with shards of glass from jars and bottles, which I smashed with a hammer :D I then soldered the edges and painted on it with glass paint. I sold and gave away all the ones that I made throughout the years, and haven’t started making them again because it involves so much time and work. But I still think it was a really good idea. I really like the organic shape of the glass and the idea that it came from a broken bottle. Last year I took a workshop in felting. 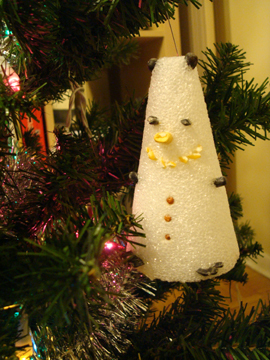 It was an ornament workshop and we made a Santa, a snowman, and a penguin. I gave away the Santa and the snowman and kept Mr. Penguin. 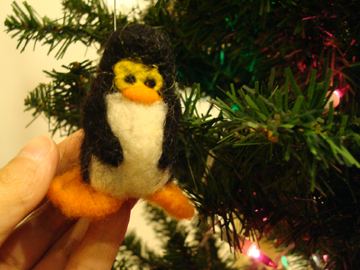 Mike quickly pointed out how he bears a striking resemblance to the Linux Penguin. 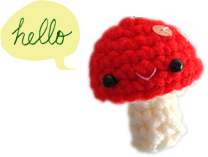 The workshop instructor kindly offered us extra felt to take home to practice, so with the extra felt I made this mushroom. There are also an assortment of pine cones and plastic hollies in the tree from floral arrangements that Mike’s office received. 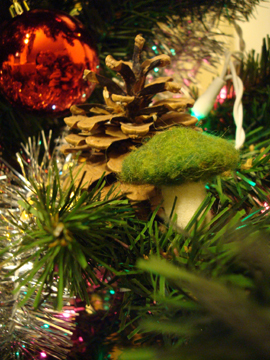 I’m thankful for his co‐workers who asked him to take those home for me before throwing out the arrangements :D They make excellent tree decorations because they come with a long wire stem, which are very easy to insert into the mass of plastic tree needles and make the decorations look like part of the tree. 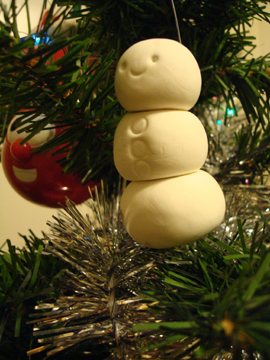 New to the tree this year are my ornaments from the dough adventures. 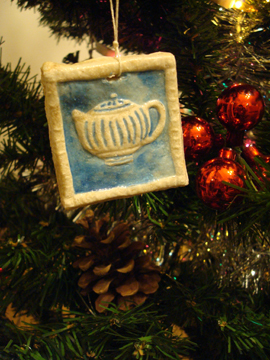 Here’s the teapot one made from the cookie mold my friend kindly passed on to me. 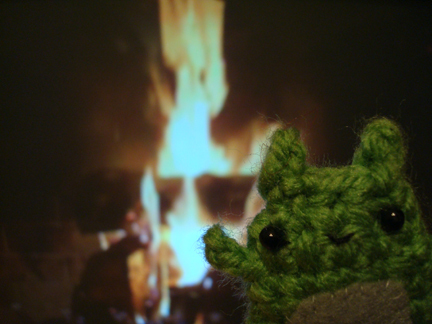 But the most special thing about the tree this year is the fireplace under the tree. 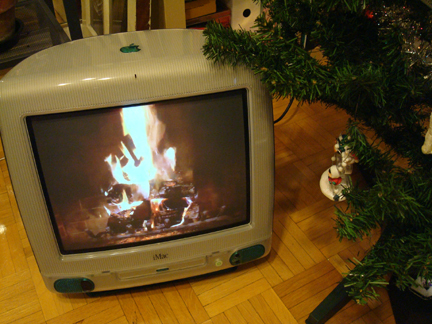 Yes, a fireplace in an apartment! Warm wishes to you and your family! I still love that tree! Glad to see it is still in good use, even if the only decoration I recognized from before is the star on the top! Yep, the star has been on the tree for a long time. 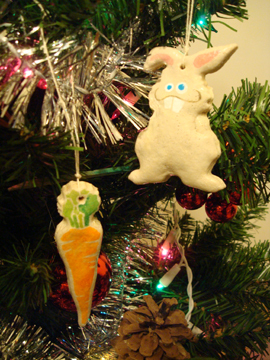 I didn’t make it though; Dan bought it from a church bazaar when we were kids. what? you didn’t make it? ooooh. but church bazaars are the funnest! i’m glad it came from a church bazaar.